Thu., Nov. 10, 2016 7:00 p.m. 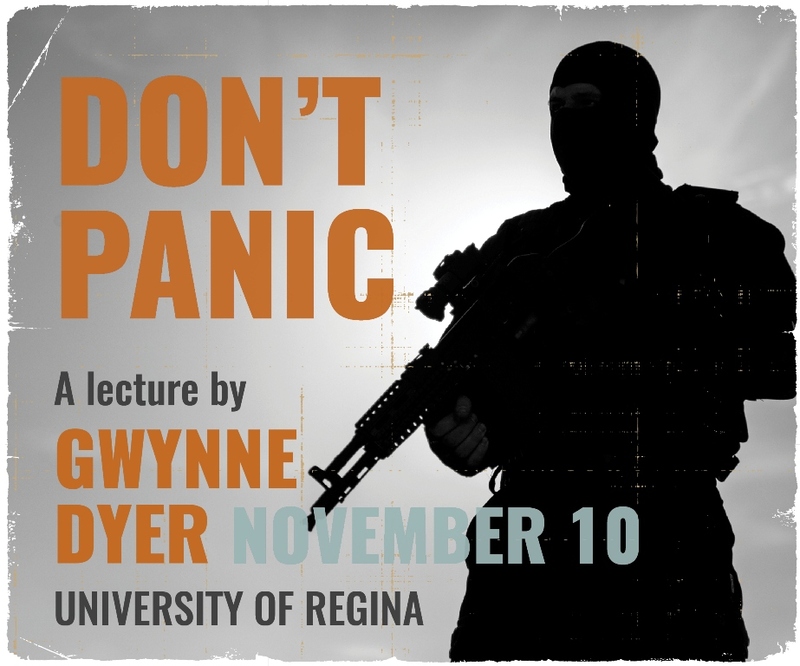 Award-winning journalist, author, and broadcaster Gwynne Dyer presents: Don't Panic. The rise of a terrorist “Islamic State” in parts of Iraq and Syria in 2014 and the unbridled cruelty of the ISIS fighters who serve it have frightened a great many people. They have declared a “Caliphate” that claims the loyalty of Muslims everywhere, and comparable Islamist groups are active in almost all other Arab countries. Is Osama bin Laden’s dream of a Muslim world united under extremist leadership creeping closer to reality? Probably not, says Dyer, but Islamic State, al-Qaeda, al-Nusra, Boko Haram, al-Shabaab and the rest are revolutionaries with a political programme, not just vicious idiots with guns. Their political programme, for those who do not share their own quite peculiar religious convictions, starts at the implausible and ends up deep into the surreal, but all their actions are calculated to bring the day nearer when that programme will be fulfilled. Bad news for many people in the Middle East if they succeed, but there simply aren’t enough people and resources there to make them a global threat. And terrorism is a minor threat elsewhere, unless the potential victims succumb to panic and start doing stupid things themselves. The level of fear of the future is definitely rising, and Dyer's lecture is an attempt to assess the real level of risk. According to him it’s not nearly as high as it seems. An updated 2nd printing of Gwynne's new book, Don't Panic: Islamic State, Terrorism and the New Middle East, was published in March. All are welcome to attend this free public event. Free parking on campus is available in lots 6, 7 and 8. Pay parking is available at kiosk and at meters throughout campus. For more information please visit the event website.